No matter how you like to learn, Matt has a solution. From personalized one-on-one instruction to on demand courses and workshops, you’ll learn how to take your playing to a new level. Here’s what Matt’s students have to say. I’ve been taking ukulele lessons from Matt for almost 4 years now. Before starting, I had done my research, and I knew he was a fine virtuoso player, as well as a professional teacher who held formal qualifications in music theory and sound engineering. A full time, specialist ukulele teacher, not one who saw it as a bridge to other instruments. I choose him as my teacher because I wanted someone who could not only tell my HOW to do something but WHY it was done that way. Personally, I wanted an explanation of the musical theory as well as the practice. Matt has been exceptionally good at catering to my needs. Along the way I have had the privilege of receiving clear, concise and detailed lessons delivered – invariably – with good humour and an understanding of my personal interests. As well as providing me with a great education in music theory and its application to arranging music for the Uke, he has progressively stretched my abilities to playing an increasingly eclectic range of pieces including the classics, Jazz standards and even modern rock. 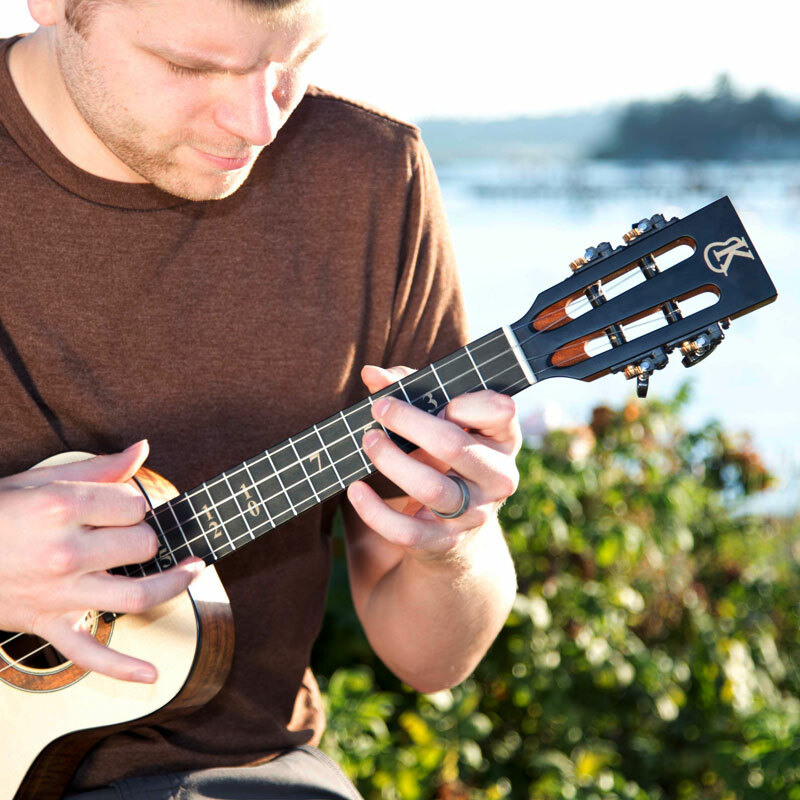 Everyone’s interests and abilities in music and ukulele playing are different. Matt provides lessons tailored for the complete beginner through to the advanced player. Whether you want to learn to play a particular piece, or want to explore the entire capabilities of the instrument and the associated theory along the way, I have no hesitation in recommending him as a thoroughly professional, experienced and dedicated instructor. Prior to meeting Matt I had played the ukulele (my first ever musical instrument) for two and a half years. My specific area of interest is instrumentals; primarily chord melodies. I started out playing simple tunes and arrangements, but I had this crazy idea that I wanted to play the music of Jake Shimabukuro. On my own I was trying to watch videos of Jake, or people playing Jake’s music on YouTube, and work with existing tabs or try to write out my own tabs from reviewing the videos. I tried slowing down videos to learn Jake’s techniques, and pick up on strum patterns and nuances of his style. My progress was glacial and I felt like I was spending more time trying to analyze and understand his music, rather than play his music. I finally made the decision I should have made when I picked up the ukulele. Matt and I have been working together for over two years and my progress has been exponential. I am now playing Jake’s Ave Maria, Blue Roses Falling, Heartbeat/Dragon, In My Life, Let’s Dance, Me & Shirley T., Missing Three, Piano Forte and While My Guitar Gently Weeps. In addition Matt has worked with me to arrange from voice/piano sheet music songs from Green Day and Muse. Never, ever dreamed I would be able to do that. I can’t even count up the number of different techniques that he has helped me incorporate into my playing. I think what makes Matt a great teacher is that he listens to the student. On our first lesson I showed him how I was stumbling through Me & Shirley T. He didn’t say I was crazy to think I could learn that song. He didn’t say that before I could learn that song we needed to back up and I had to learn a, b, and c first. He has the unique ability to listen and understand what will motivate each student, and design the lesson plans around the student’s interests. His ability to break down each measure, complex strum patterns, and new techniques in such a way so that someone like me, with absolutely no musical background, can grasp them still amazes me. He is an incredibly talented player but he very well may be an even better teacher. I was planning a trip to Hawai’i and I had purchased a ukulele in anticipation of the trip. Then I realized that I could not learn how to play on my own. Living in rural Illinois, I had no choices for local instructors so I began looking for online instructors. There were not many people teaching ukulele online back then and Matt seemed more than qualified. I admit I was more than a little star struck at our first lesson. I was an absolute beginner and felt a little unworthy of such a talented young man. All I really wanted to learn was how to strum. Ha! No worries, Matt knew just how to approach my skill level. I had no idea I would come so far with Matt’s teaching of theory, ear training, advanced strumming, transposing, arranging, etc. He even gave me a lesson on nail care! He truly knows how to engage me, forming a learning partnership When an illness slowed me down for a few months, Matt adjusted lessons to help me continue to keep the ukulele in my life. That was something truly important to me. Most notably, Matt is an all-around nice guy and fun to meet up with once a week. 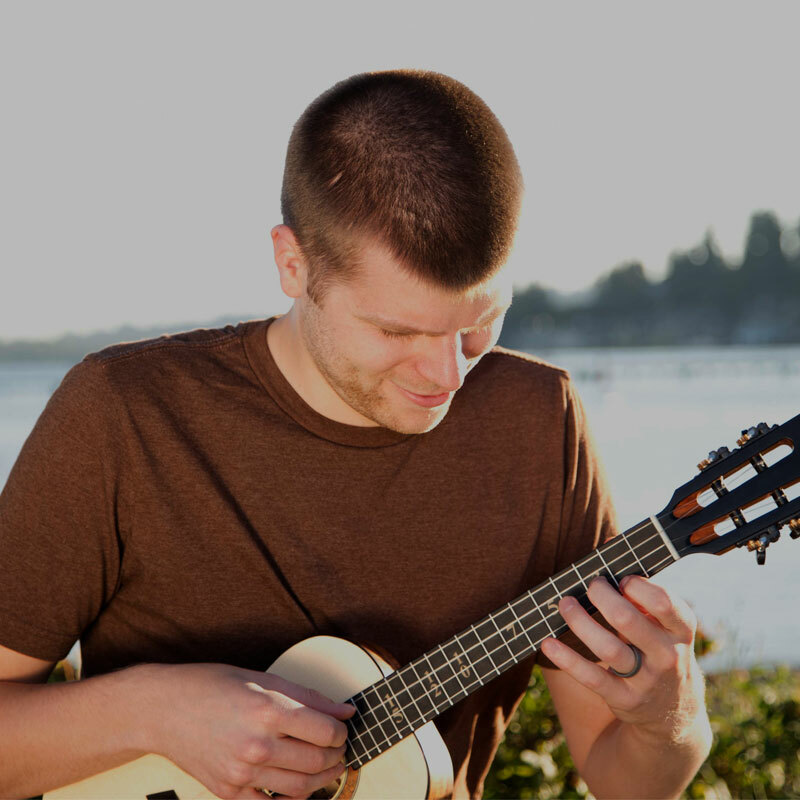 I have been taking online ukulele lessons from Matt for over five years. FIVE YEARS!! That should be it, all you need to know, testimonial over, mic dropped . . . but let me tell you a little more about this five year journey. The best thing I can say about Matt as a teacher is that he gets me. We’ve been all over the map in my lessons . . . learn a song (from Manilow to Dahlberg and every song in between), learn a technique, arrange a song, write an original, but no matter what we’re working on, he teaches it in a way that is tailored for me. He draws from his vast knowledge of the uke, of music theory, and of technique, and makes it all understandable, but more importantly he makes it usable. That being said, I don’t want to short-change the people part of this. This doesn’t work, especially for five years, if Matt wasn’t as good of a person as he is. He invests in us. He cares about our progress as uke players and cares about our lives as people. Each of our lessons begins with a “how was your week?” and we run through our “checklist” of things to discuss before we jump into the lesson. Some people may not like that, for me it’s essential (although those little chats were more fun when a certain football team didn’t stink so bad). As we wrap up each lesson, Matt says, “Let me know if you have any questions and I’ll see you next week. Thanks Alan” No, you’ve got it backwards. Thank YOU, Matt. Thank you for supporting me as a uke player and as a person. Thank you for your investment in me. Thank you for your friendship. Thanks for the last five years, and as lives change (a baby? wow, who would’ve thunk? but I think you need to rethink naming him Beast Mode Dahlberg), here’s to many more. Having been a student with Matt for nearly 4 years, starting as a beginner, I can honestly say that Matt’s teaching approach has been ideal. 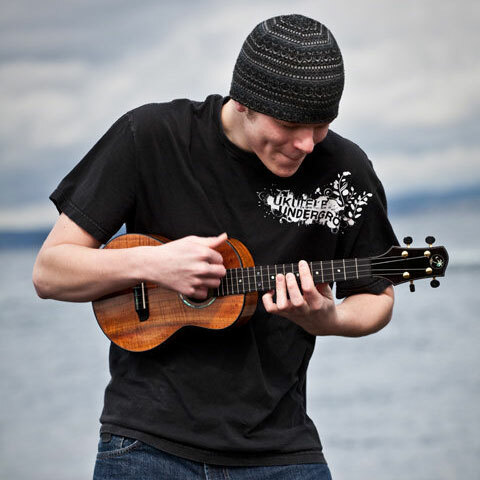 Matt has a structured yet relaxed manner of teaching ukulele that is hugely effective and the way in which simple targets are set to let me see measurable progress has been invaluable. I look forward to each session with Matt knowing that he will move me along at the right pace — I never feel pressured yet always feel stretched and learn something new each week, which is a great motivator. I can say with confidence that Matt is a patient and skillful teacher — his technical skill and musical knowledge offer a blend of practical and musical theory, which works well and is the hallmark of a skilled professional musician and teacher. Matt has a wealth of teaching resources and methods — whether it’s learning a new song, a new playing technique, or brushing up on music theory, there is always something on tap to be printed out, listened to, demonstrated or played along to and all tailored to the specifics of each lesson. Oh, and best of all, it’s a lot of fun! No matter where you live, you can take ukulele lessons with Matt. All you need is a dependable internet connection and a ukulele! 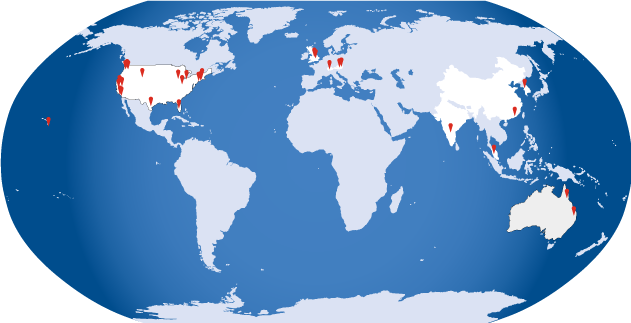 Here are the locations of just some of Matt’s students from around the world!